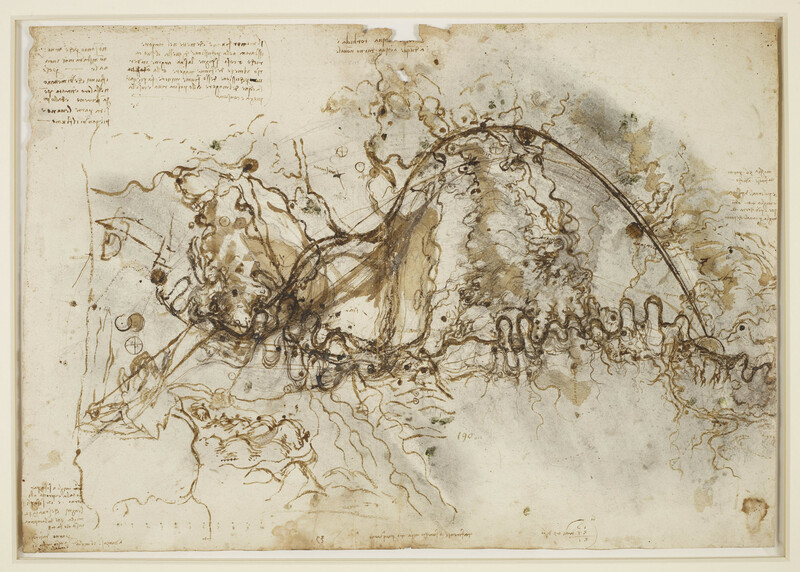 On this sheet, Leonardo plots the course of a great canal to bypass the Arno, for the river is not navigable as far as Florence. The proposed route is north from Florence (at far right), via Prato and Pistoia, through a deep cut in a mountain pass, and then through two marshy lakes before rejoining the Arno near Pisa. But there is no evidence that his plans were ever seriously considered by the Florentine government. A second, unrelated scheme seems to be indicated at the left of the map. The Arno is not inked beyond the dark circle that represents Pisa, then under siege by Florence. Leonardo visited the Florentine camp in July 1503 and, with the support of Niccolò Machiavelli, proposed a scheme to divert the Arno and cut Pisa’s access to the sea. Diversion channels seem to be drawn here as dark lines from the Arno south-west towards Livorno, and digging of a channel actually began in August 1504, but the scheme was soon abandoned. Leonardo was a respected engineer and mapmaker. He worked for a spell as military architect to Cesare Borgia, Marshal of the Papal Troops, and drew up plans to drain the malarial Valdichiana in Tuscany and the Pontine Marshes south of Rome.